Pink quartz walls in the capitol building in Denver, absolutely gorgeous! Each piece is so different and has so many hidden pictures in it!! I think I see a glorious bull dragon! Georgia in her pink ballerina socks. She really loved them and danced all evening. Talk about a calf workout! A quick little doll diaper made from scrap fabric. I need to make some smaller ones next time. Hope everyone has a wonderful pink day! Please take the time to visit some of the pink blogs with Beverly at How Sweet the Sound. A blog that I enjoyed reading last week was Valerie. Her crazy quilting is beautiful! The weather here has been so hot with not too much rain around. Staying inside is not normally my style but it's hard to breathe out there! Great excuse for staying on the computer!! 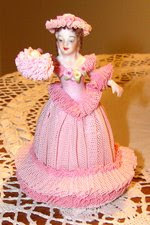 G'morn Sue ~ What an adorable tippy toe pink darling! Love the pink marble. That pink quartz is stunning...what amazing beauty God creates! Very clever doll diaper, too! Have a beautiful weekend...stay cool! Sue ~ such darling ballerina socks! I should get some to wear when I teach!!! Believe me, it does give your calves a workout!! Happy PS to you. Such sweet pinks. Happy Pink Saturday! Beautiful pinkies! The ballerina is so adorable. thanks for sharing! have a nice month!!! I've seen Georgia her so little and she's growing and growing into a little lady! PINK PINK PINK - How fun! And little Georgia is ADORABLE! My little one (she's 15 now!) wore out 3 pairs of PINK ballet slippers before she was 3! Looks like Georgia is on the same track! Great pinks - the marble is beautiful!